Due to stellar reviews from Grim and Char, I decided to pick this up. I'm not familiar with the Marvel universe so I wasn't sure what to expect. I thought it would have action, perhaps some humour thrown in but I wasn't prepared for the themes this comic dealt with. 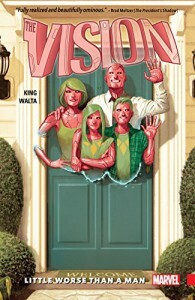 Vision craves the dream of having a family and as he was created, he creates a family to give him the life he thinks he needs to fit in and be normal. His wife Virginia and his twin teenage children, Viv and Vin move with him to suburbia and try to settle into a life that is ordinary. Things take a dark turn when Virginia has to protect herself and her children from a threat but doesn't want to disrupt their 'normal' life so does not tell Vision about the outcome of the altercation. Things spiral out of control as secrets come to light and their perfect family existence starts to crumble. This read brought up all kinds of questions regarding humanity, family life, social norms and prejudice. For me this was far more emotional than expected, I felt sad as I was drawn deeper in the story. Each member of the family had different stresses but they were of the same theme, the need to appear normal, at all costs, no matter the personal sacrifice. Tragic and a little heartbreaking, this was a far different super hero comic than I expected.